The dragon, Tintaglia, has been released from her wizardwood coffin, only to find that the glories of her kingdom have passed into ancient memory. Meanwhile, Malta Vestrit navigates the acid flow of the Rain Wild River in a decomposing boat, accompanied by the Satrap Cosgo and his Companion Kekki. 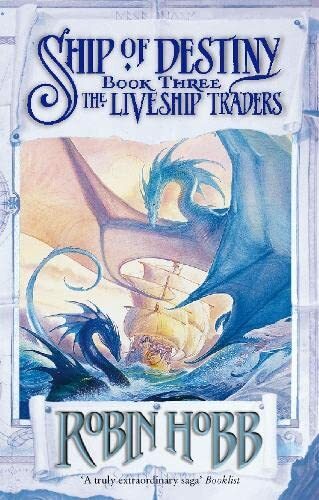 The triumphant conclusion to the magnificent Liveship Traders series. The dragon, Tintaglia, has been released from her wizardwood coffin, only to find that the glories of her kingdom have passed into ancient memory. Meanwhile, Malta Vestrit navigates the acid flow of the Rain Wild River in a decomposing boat, accompanied by the Satrap Cosgo and his Companion Kekki. Against hope, a ship appears in the alien waters, but does it mean rescue, or a further nightmare, for Malta? In ruined Bingtown, the citizens are at war, against the Chalcedean mercenaries besieging the harbour, and also among themselves. If the city is to survive, Ronica Vestrit must unite all its peoples -- both Trader and Tattooed -- and liberate the city once and for all; but Companion Serilla has a different agenda, and is seeking to establish her own power base. Althea and Brashen are finally at sea together, sailing the liveship Paragon into pirate waters in a last-ditch effort to rescue the Vestrit family liveship, Vivacia, stolen by the Pirate king, Kennit; but there is mutiny brewing in their rag-tag crew; and in the mind of the mad ship itself...Wintrow has liberated She Who Remembers and she can at last fulfil her ancient purpose, but in doing so he has been terribly injured. If Wintrow dies, Kennit fears that Vivacia will lose her fragile sanity: a loss that will also threaten his dreams of power and glory. So he strikes a deal with the ship. And soon the waters around the Vivacia are seething with giant serpents, following the liveship as it sails to its destiny. Majestic and sweeping, Ship of Destiny concludes the tale of the Vestrit family and their part in the history of The Liveship Traders with a soaring and triumphant finale to this unique series of epic fantasy.